For these reasons, I was intrigued by this recent NYT article by Nicholas Kristoff (The American Dream Is Leaving America). The core of the article points out that America used to have unrivaled education. As a result, it was a land of opportunity. Now, other countries have improved their education systems, and the formerly stellar American system has become one that perpetuates inequality. This may all be true (the data he presents certainly suggest so). His point is not lost on me, but I don’t think that the American ethos is that all children should be put on an escalator that will take them to success. Usually talk of an American ethos tends to revolve around the idea of a self-made man. These two ideas are incompatible. Once you step on an escalator, you don’t have to do a single thing. Instead, you get to space out for about 30 seconds and gaze down at the ground as you slowly drift away. 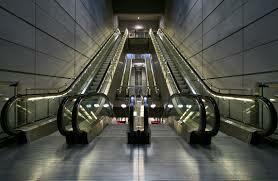 The most strenuous part of riding an escalator is stepping off at the right time. A self-made man, on the other hand, has to do a lot to get up to the next level. We assume that everything he does on his way up is more strenuous than stepping off an escalator. For this reason, I don’t think our goal in America should be to fix an education escalator. Equal opportunities for all children – yes. But stepping on shouldn’t guarantee success. Maybe instead we should work on building a big, sturdy education staircase. It’ll be equipped with a handrail to guide weak and unsteady students, but they have to put in effort in order to progress.